Mike was able to join us on a whim after we realized we could record a show this week! After Dave asked about a fireman’s pole in a house, Chris mentioned this watertower house. Chris just opened up registration for the first session of Contextual Electronics! Mike continues to work on the HackRF. In fact, he is just about to send it off for the prototype run! Dave’s kickstarter continues to kick, now funded over $80K! Dave is worried he’ll tip over into needing to buy two reels of the fancy parts on his board (not available in single quantities). bertooth vs the HackRF (many more people for the latter). Dave doesn’t know who Jay-Z is. Dave recently had a great score at auction, purchasing lots of test gear. People don’t realize there is significant cost in purchasing said gear. One of those projects includes the Daisho board. The main board was designed by Jared Boone of ShareBrained. Chris looked at this to see the PCB stackup (for sending it to be manufactured). Could Silcon Valley ever move to Cleveland? No, probably not. But in a modern economy with lots of telecommuting, it seems to be the people and the funding that are most important…not the geography. Mike will be attending ShmooCon in Washington DC, Troopers in Heidelberg Germany and Hamvention in Dayton OH. He previously attended the Digital Communications conference in Seattle (as did Jeff K), which was put on by TAPR. He also has attended ToorCamp and will again this year. Ruxcon is in Australia but will be too big of a hike. The antikythera computer was an early example of movement and calculation. Mike has an awesome hobby in February — he goes to the Fairbanks (Alaska) world ice carving championship. In the past, he had made penguins. He and his partner focus on kinetic (ICE!) sculptures. Thanks again to Mike for being on the show again. It was a great way to finish out the year. See you all in 2014! 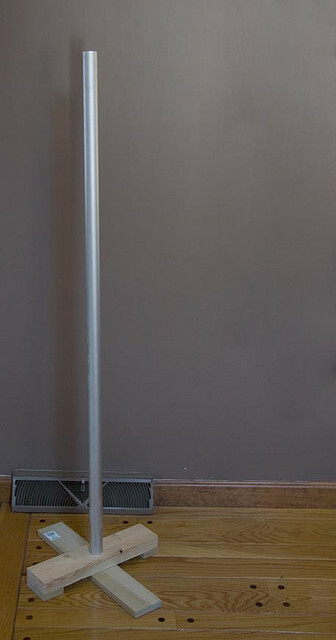 Thanks to Matthew Keefe for the picture of the Festivus Pole! DJ Delorie did a plugin for gEDA/PCB that does matched traces. I don’t know if he ever released the source. When I did length matching in gEDA, I did something similar to what was mentioned in the show, except that gEDA PCB doesn’t have any trace properties, so I just made a text file of each group of traces along with an additional property of ticks of delay that can be added inside the fpga. A script would then read out trace length of everything in the group, calculate the average, longest trace, shortest trace, and print out some stats. My hat is off to you Russ. That is more labor than I would be prepared to invest in it. I have been doing analog layout for long enough to know better than to trust autorouters with anything. That said having one that can match trace length and impedance is a critical thing. For a really involved board having the ability to nudge whole buses around is a critical thing. For larger digital stuff with a lot of parallel routing I would want a rule based autorouter. Perhaps this is because I have never experienced one. Any comments? Did Dave ever recall what the name of the documentary he watched was called?